Android is a great mobile operating system that offers many customization possibilities. You can, for instance, install a custom launcher for an improved visual experience or a custom ROM for more system wide changes. If you like the Android version on your device as it is, but want to add a few features, the Xposed framwork might be the perfect solution for you! Xposed is a framework for modules that are able to modify the behaviour and looks of the Android operating system and apps. This means, that you are able to install modules which add custom ROM like features to the Android OS running on your device. These modules include both visual- and performance improvements. So why should you try Xposed instead of a custom ROM? Sometimes custom ROMs can be buggy, overloaded or not even be available for your device. With the stock ROM running fine on your device, Xposed let’s you add the features you want without heavily modifying it. You can also combine Xposed with a custom ROM, to get even more features. It is important to say that Xposed is not compatible with Android’s new dalvik alternative called Android Runtime (ART). Luckily, Xposed will deactivate ART automatically if you install it. 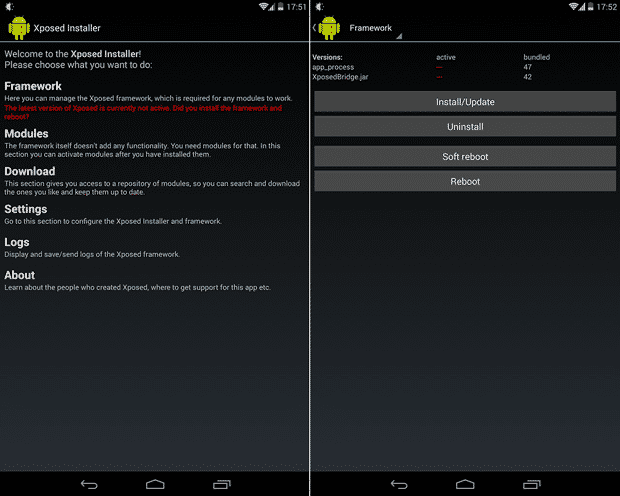 To install Xposed, you need Android 4.0.3 or newer and root access. However, Android 5.0 is not supported. 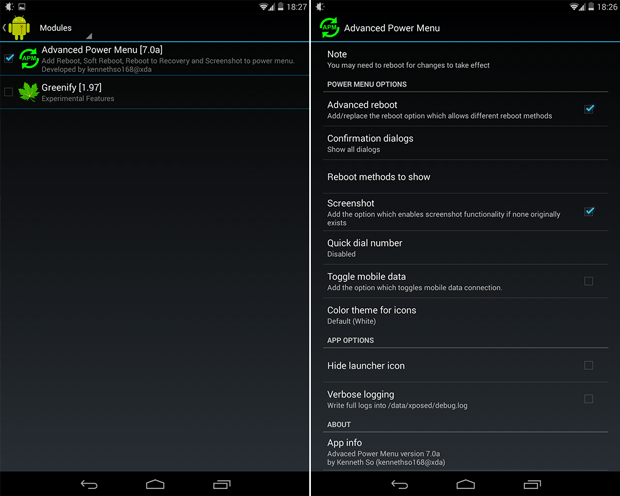 To check which Android version you’re running go to Settings -> About phone / tablet -> Android version. If your Android device is not rooted yet, check this guide to get root access. Please perform a NANDROID backup before you get started in case of any problems. If you encounter any problems, have a look at the official support thread. Just like with any other app, you’ll be asked to confirm the installation. To use a framework, navigate to Modules and activate the framework you want to run. 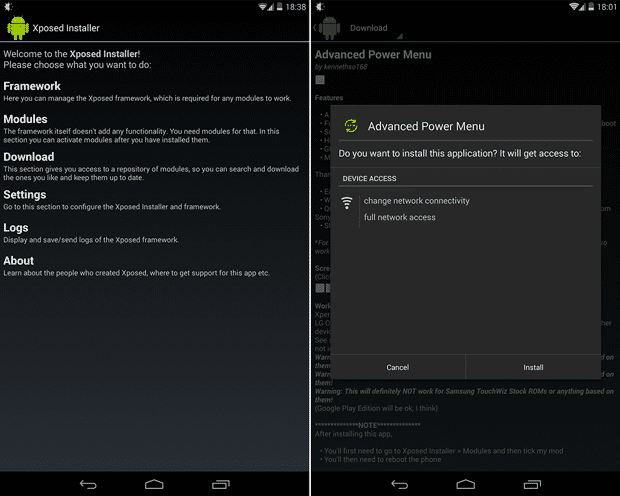 For the module to start working, you usually need to reboot your Android device again. To access the modules’ features, start it from the modules menu. The Xposed framework is a great way to improve your Android experience. It does not matter if you love stock Android, no good custom ROMs are available or if you want to improve the Android version you’re already running. I’ve listed a few cool Xposed Framework extensions in this article.